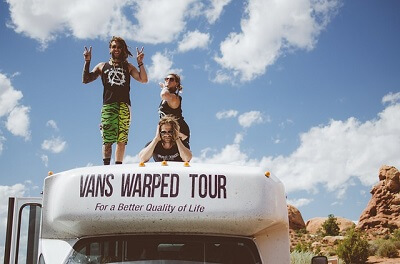 Get notified when Vans Warped Tour tickets are available! Fans of The Warped Tour have been waiting with baited breath to find out news and locations of the next Warped Tour, but for now they are still waiting. The same goes for Warped Tour tickets as well, because once they go on sale, they sell out fast! One of the things that has always set this tour apart was the way it combined extreme sports with killer music line-ups. Some of the hottest, most cutting edge names in music have been a part of the tour, and the Warped Tour promises to be just as full of excitement year after year.